Do You Understand The Speech Level Singing Technique Theory? Get a crystal clear understanding of the speech level singing technique theory. And put this powerful method to work in your voice. The speech level singing technique is a method of learning to sing created by Seth Riggs. It is a way of singing with a large range, with power, expressiveness, and best of all... with the effort that it takes to speak. In your throat there is a grouping of cartilage and muscle called your larynx. Another term you may have heard that is used a fair bit is the voice box. If you gently run your finger on your throat, you will be able to feel a point of your larynx. This notch in your throat also has a common name. Your adam’s apple. Inside your larynx there are two muscular folds known as your vocal chords. When you sing, your vocal chords hold together as air pressure is pushed up through your windpipe. The air pressure “pushes” on your vocal chords, and when the pressure is enough, the chords open, letting a small burst of air through. The chords quickly close… and then the same process repeats many more times. This process of the vocal chords opening and closing would be happening 440 times per second! And as you sing higher, more and more cycles happen per second. This is a basic explanation of how your sound is made when you sing. Can you remember how we discussed your larynx? Well, in the speech level singing technique theory, a great deal of importance is placed on keeping your larynx in a stable, central position. 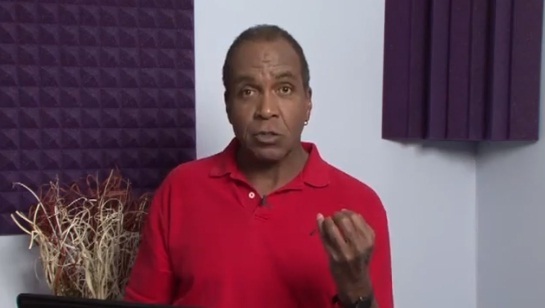 When you do this you will eliminate all vocal tension, and you will be producing your tone correctly. So what does it mean to keep your larynx in a stable, central position? Now, pretend your eating a piece of toast and swallow. Can you feel how your adam’s apple moves upwards? Also, if you say the word “DAD” in a really dopey, dull tone… you will notice that your adam’s apple moves downwards. One of the main focuses of the speech level singing technique is to use exercises that “free” your voice from these downwards and upward movements. Doing this takes all the strain off your voice, and also makes it easier to sing in a much greater vocal range. Another thing that the speech level singing technique theory really focuses on is keeping the vocal chords closed through your entire range. You are only producing your tone correctly when your chords are holding closed. Any other way of singing is inefficient, takes far more effort, sounds breathy, and is also unhealthy for your voice. Does your tone sound breathy? If so, your vocal chords aren’t holding together properly. The speech level singing technique uses special exercises to correct this problem. When you sing, you will find that some areas of your voice are much easier to sing with closed chords than others. The areas where it’s harder to keep your vocal chords closed are your “passage areas”. These are the areas that tie your voice to the next vocal register. In the speech level singing technique theory, a lot of emphasis is put on learning to negotiate these bridges easily, so you can sing in all your vocal registers (chest voice, mixed voice, and head voice are the main ones), and therefore have a large, powerful vocal range. The Most Effective Vocal Technique? Overall the speech level singing technique theory is undoubtedly the most successful singing technique around. No other method can even come close the number of singing superstars that speech level singing has produced. My hopes is that this article has given you some insight into the speech level singing technique theory. And also given you an understanding of how effective this technique is and how large the impact on your voice could be with speech level singing exercises. Now, if you want to benefit from the speech level singing technique, you can take lessons in a few different ways. The most obvious one is to go to the official website, and select a certified instructor and have some phone or lessons in person. A vocal instructor by the name of Roger Burnley has put together a vocal instruction package that covers the speech level singing process in detail, with a bit of a twist. Check out Roger's program by clicking here. Now, my understanding is that Roger is a former speech level singing teacher who “broke away from the pack” to do his own thing. I have had both speech level singing lessons with a certified teacher AND studied from Roger’s program. They are both very valuable. But I found that Roger’s singing program is a much better starting point. The reason is that in this program you get the whole picture. You learn about the entire singing process (how to sing at speech level, with excellent tone, and a large range), and you are given the tools to transfer this knowledge to your voice. With private lessons however, it would take around 10-20 lessons just to get the same info. As Roger says on his website, you get over 6 hours of lesson time in this package (over $3000 worth if you had the lessons in person). I have had incredible results with this program with my own voice, and I highly recommend it. Good luck to you and your singing! Click here to view Roger's excellent vocal program. Click here to check out the official speech level singing website, and learn more about the speech level singing technique theory.